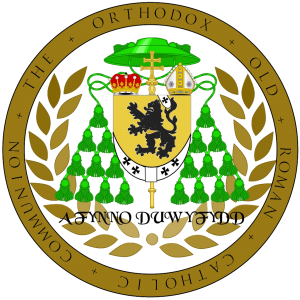 The North American Old Roman Catholic Church is the original, historic and canonical Old Roman Catholic jurisdiction in the Western hemisphere. It came to the United States on November 7, 1914 when the Prince-Bishop Rudolph de Landas Berghes arrived here from Great Britain. Bishop Berghes had been consecrated by the Old Roman Catholic Archbishop, Arnold Harris Mathew in London on June 29, 1912. He emigrated to the United States due to the political climate in Europe during the early years of the First World War. Bishop Berghes was a subject of the Austro-Hungarian empire with whom much of Europe was at war; he was related to most of the royal houses of Europe, including the Royal Family of England; and it would have been a great embarrassment to the Royal Family and to the government of Great Britain, to have interned a family member of the aristocracy as a resident enemy alien. Thus with the assistance of the Royal Family, the British government, the government of the United States and the direct cooperation of the Church of England and the Episcopal Church, Bishop Berghes left England and took up residence in the United States. He settled first in New York City, later in Waukegan, Illinois, later still in Chicago, Illinois and finally in Philadelphia, Pennsylvania where he died in 1920. Bishop Berghes straightway began a mission of the Old Roman Catholic Church here in the USA and on October 4, 1916 consecrated as a Bishop, The Most Reverend Carmel Henry Carfora, a former Roman Catholic Franciscan Friar, to serve as his associate and colleague. Together they laid the firm foundation in the Catholic Faith, with an indisputably valid lineage of Apostolic Succession of Holy Orders, descended from Rome and currently held in common by the greater part of the Roman Catholic hierarchy throughout the world, on which The North American Old Roman Catholic Church firmly rests today. Bishop Berghes was elected as the First Primate of The North American Old Roman Catholic Church in 1916 and served in that capacity until December 22, 1919 when he returned to the jurisdiction of the Roman Catholic Church, entering the Augustinian Friars in Villanova, Pennsylvania where he died on November 17, 1920.